For an accessories update this season, look no further than brand new online boutique Treasure Jewellery – a specialist jewellery and accessories site that’s passionate about delivering designer pieces at affordable prices. Founder Natalia Osminova started her career as a gemologist specialising in diamonds and working with high-profile clientele who were interested in exclusive and very often expensive jewellery. The idea for the site came from her love of working with precious stones, but without the designer price tags attached. This season Natalia’s vision brings together a collection of uniquely designed accessories, aimed at providing women with wearable and eye-catching pieces without having to spend a fortune. The site’s pieces are all of the upmost quality, which means you’re not sacrificing solid craftsmanship for price. These fantastic pieces are produced in limited edition runs, so there’s only a limited time to get your hands on these exclusive accessories. Stocking everything from standard necklaces and earrings to clutch bags and collars, the site is constantly expanding to feature new lines. Plus there’s free UK delivery when you spend more than £30. 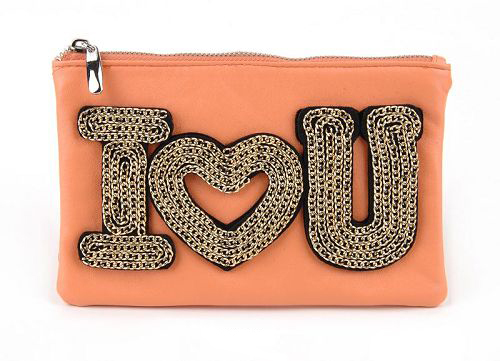 We love the peach I LOVE U clutch bag – a steal at just £12! 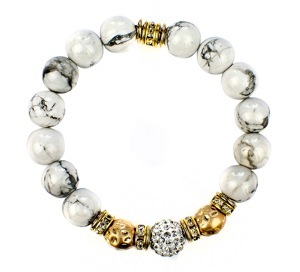 – and the lovely Howlite bracelet with marble detailing. Our favourite piece is the Love necklace in gold with cute red detailing and an inscribed pendant – the perfect update to an all-important Valentine’s Day outfit. 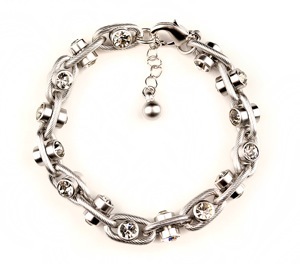 Whether you are looking for statement hair-bands, beautiful beaded bracelets or eye-catching rings and necklaces, Treasure Jewellery is a trove of statement pieces.